A visit to Blackberry Hill Farm in scenic Columbia County in upstate New York is a treat for the whole family. Springtime brings lambs and new growth in the greenhouse and gardens. 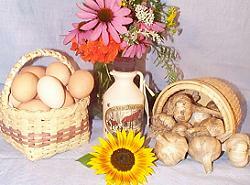 The chickens busily scurry around scouring for new shoots and bugs they missed over winter. March is sugaring time. Spring is in the air and so is the sweet smell of our organic maple syrup. Sheep shearing happens around the beginning of April and fleeces are available for inspection and for sale. The llamas are forever frolicking up and down the hills to get the kinks of winter out and we also begin the process of shearing them. The herbs and berries for our jams and jellies are sprouting and the garlic is growing and needs feeding. Gardens are being planted and there is never an idle day. June is time for garlic greens. What a treat! In July, we harvest and cure our garlic crop, planning all the while for October and planting for next year's garlic crop. Visit our farm and road stand. We've been told our free range brown eggs are the best. There's always something special at Blackberry Hill Farm.